3-room apartment 73 m2, on the upper ground floor, south facing position, bright, beautiful and cosy furnishings: living/sleeping room with panoramic window with 1 double sofabed (2 x 90 cm, length 200 cm), international TV channels and flat screen. Exit to the balcony, to the loggia, to the patio, south facing position and west facing position. 2 rooms, each room with 2 beds (90 cm, length 200 cm). Kitchen (oven, dishwasher, 4 ceramic glass hob hotplates, microwave, electric coffee machine) with hatch, fondue Set (cheese) boiler (20 litres). Bathroom, sep. WC. Electric heating. Parquet floors. Large balcony, south facing position and west facing position. Balcony furniture. Marvellous panoramic view of the mountains. Facilities: hair dryer. Internet (WiFi, free). Garage, height 210 cm. Please note: non-smokers only. Chalet 'Bergfink'. In the district of Terrassenweg, 2.5 km from the centre, in a sunny position, 100 m from the skiing area, south facing position. For shared use: garden. Patio. In the house: storage room for skis. Linen change weekly (suppl. charge extra). Pre-arrival grocery service. Storeroom available. In Winter: please take snow chains. Communal covered parking at the house. Parking space or garage only for small to medium-sized cars. Shopping centre 2.5 km, restaurant 100 m, bicycle rental 2.5 km, bus stop 'Bodmi' 50 m, railway station 'Grindelwald Dorf' 2.8 km, outdoor swimming pool 5 km, indoor swimming pool 2.5 km. Golf course (6 hole) 3500 km, tennis 3 km, minigolf 2.5 km, sports centre 2.5 km, ski lift 100 m, gondola lift 2.5 km, slopes 50 m, ski rental 100 m, ski bus stop 50 m, ski school, children's ski school 100 m, children's playground 2.5 km. Well-known ski regions can easily be reached: First, kl.Scheidegg / Männlichen 4 km. Well-known lakes can easily be reached: Thuner-/Brienzersee 18 km. Please note: ski bus (free of charge). Free ski bus service to the ski region First and kl. Scheidegg/Männlichen. In case of good snow conditions, the house is accessible on skis. the view, the light, the quiet, the direct access to the garden from the balcony, pictures from Jungfrau artists in the decoration. when snow conditions permit. Bodmi children field 50 meters away. Incredible place with a big view of the Eiger. Clean and comfortable in a quiet neighborhood a short walk to the Main Street. We will be back! 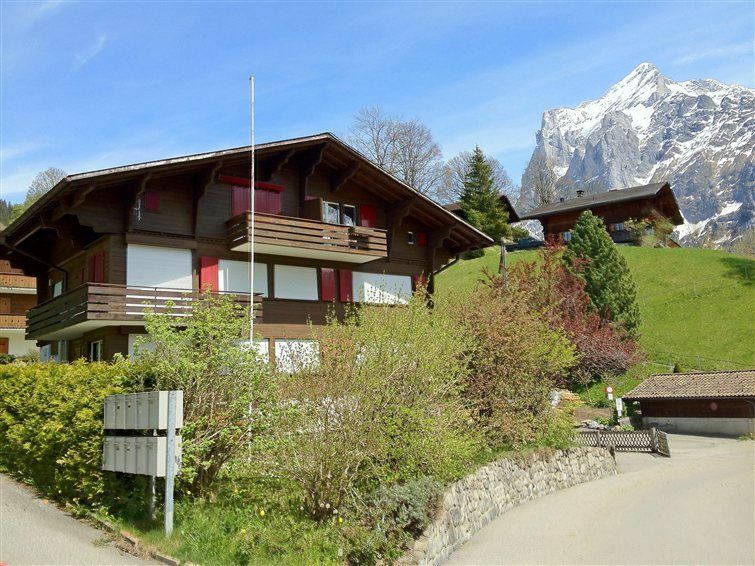 Nice, comfortable chalet with spectacular views. Easy access to the bus or trail into town. We had a wonderful stay at this chalet in Grindelwald this past weekend. The best part about this place is the view - spectacular!! The location is also ideal - a little ways off from the main street in Grindelwald, so it's nice and quiet, but close enough that you could walk to all of it if you wanted to... which means walking distance to lifts, train station, restaurants, trail heads, etc. The flat had everything we needed, and was clean and in good condition. The heated portion of the porch was another thing we really loved about this place. It was so nice to sit there comfortably into the evening watching the mountains get dark, even after it got a little chilly out. The kitchen was reasonably well equipped, although if you plan to do any major cooking you might want to bring your own measuring spoons/measuring cups... I didn't see any of those and had to do a little estimating! The only negatives about the place I could find - the only toilet is in a half bath near the front door and kitchen, which seemed a little awkward in the middle of the night. Also, the garage spot for parking was very, very tight. If you drive a larger vehicle, like a minivan or SUV, you might really have a tough time fitting in the garage. All in all, those are pretty minor things, and we had a great stay. I wished we could have stayed for much longer, and would recommend it to friends and/or come back some time ourselves! Perfecto para una família de 4! Hemos estado genial! La casa es muy acogedora y el lugar de ensueño! One of the most renowned ski resorts in Switzerland. In the summer, a paradise for fantastic (all levels) hikes in the Jungfrau region, world famous. In the summer, You can get 3-6 day passes on the Jungfrau bahn.